Each fall, Bluebird birdhouse building with elementary school students is always a fun time for everyone. Grade two or three students are a good age and they are always very enthusiastic. Pre-cut bird houses (tops, sides and bottom) with holes drilled for the nails are prepared for each student, or pair of students. The teachers are encouraged to arrange for parents to bring hammers and assist. After the birdhouses are built, they are collected and put on fence posts near the city where they become acclimatized over the winter. 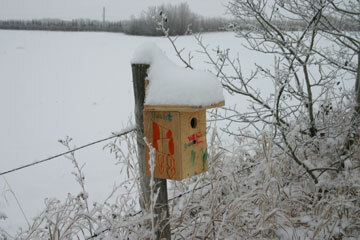 A field trip in the spring will take the students to the fence line where the birdhouses are located. Most houses will be occupied by bluebirds, tree swallows or house wrens. Up close, the students will see birds on the nest, and eggs in the nest. A very memorable experience for all!